1st Prize in "the best books printed and published in Argentina" 2007 competition. In the 20th competition "the best books printed and published in Argentina", organized by the Argentina Chamber of Publications for books published in 2007, "Fly Fishing Moments with Mel Krieger" of Diego Ortiz Mugica , won first prize in Category General that recognizes the Best Book of all categories, and First Prize in the category Art, Design, Architecture and Photography. The awards were presented on Wednesday, June 18 at the Museo Fernández Blanco , by the Speaker of the House, María Pía Gagliardi, Vice President, Javier Lopez Llovet (pictured with Mugica) and the Treasurer of the institution, Santiago Roca . "Fly Fishing with Mel Krieger Moments by Diego Ortiz Mugica "photographically documented adventures in Patagonia the best teacher of fly fishing and fly casting of our time, the American Mel Krieger, through the particular look of Diego Ortiz Mugica , fine art recognized Argentine printer. 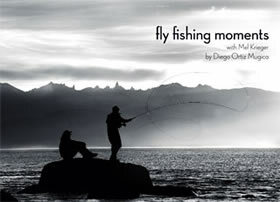 With a format of "coffee table book", "Fly Fishing with Mel Krieger Moments by Diego Ortiz Mugica "resume in a hundred black and white photographs, the essence and spirit of fly fishing, along with the stunning beauty of nature of the Argentine South. As summarized Mel Krieger about the work: "There are heroes, artists that describe the experiences of fishing images often move us further that the best words. There are moments when, in fact, words interfere with real communication. The images can make us relive moments of fishing. Diego Ortiz Mugica , fly fisherman, artist and, above all, friend, captures many of our moments of fly fishing with superb photographs. " Born in Buenos Aires on October 5, 1962, this outstanding fine art printer is an example of black and white photography, and Zonal System in South America. He has had solo and group exhibitions in Argentina and several cities, notably those produced in the Decorative Arts Museum , the collection of National Museum of Fine Arts and Cultural Center Recoleta , as well as New York and Palma de Mallorca. participated in several art fairs: Art BA , Festival of Lights , San Francisco, Chicago and Frankfurt Art . Won the Lorenzo the Magnificent in the Biennale Internazionale dell Arte Contemporanneo in Florence. He was elected to join the program Localheroes of Manfrotto , prestigious brand to photography and video. This program selects photographers who bring a different perspective on the world of photography. Only 16 photographers around the world have been selected so far. ( http://services.manfrotto.com/localheroes/ ) in Buenos Aires and Patagonia are their photo galleries and schools.